OriginalCrypto Review 2018 | Is OriginalCrypto a Scam or Legit Forex Broker? Beware OriginalCrypto is a Non-Licensed Broker. It is NOT SAFE to trade. SolutionsCM LTD. LLC Samdar. OriginalCrypto. Bulgaria. Moscow, Russia. Broker with No License and No Regulation. 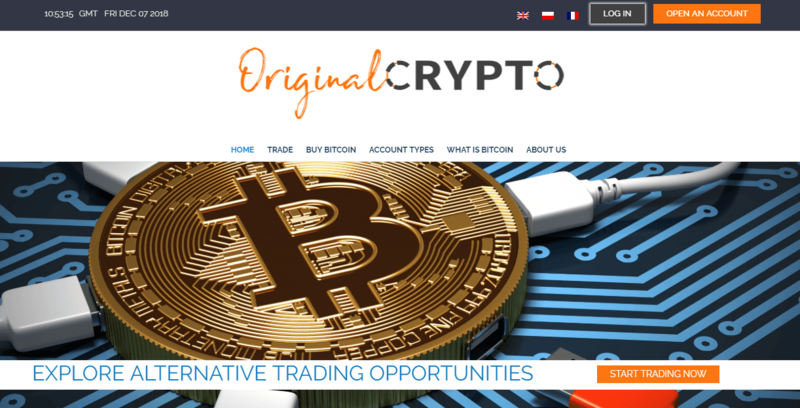 OriginalCrypto is a Forex and CFD trading provider which states their address in Bulgaria, as well established office in Moscow which provided by the owning company SolutionsCM LTD. The broker offers a variety of over 200 high-liquidity assets to trade through innovative trading tools and world-class execution. However, the concerns about OriginalCrypto revealing at the point we tried to check on the legitimate status of the broker, its regulatory status and history of operation. In fact, none of the confirmation was found, while there is no link to broker’s authorization or regulatory status, official registers or anything else that may lead to the company with a trustable establishment. Overall, there is no evidence to support trading or investing with the OriginalCrypto, even more, we strongly advise avoid any contact or investment with the mentioned broker. In order to be successful in trading one of the main priorities should be a choice of a reliable broker. As the statistic shows, most of the frauds are non-regulated entities with no specified license or supervision from the authority. Therefore, of course, we advise choosing among the regulated companies only, like UK’s FCA, Australian ASIC or other similar regulated brokers, that for instance apply for compensation and supervised at every of operation.